July's steep decline in home sales is just the latest symptom of the slowdown in the U.S. economy, and unemployment continues to hover at stratospheric levels. Investors, meanwhile, are increasingly turning their attention to the Federal Reserve to see how the world's most powerful economic body will respond. Passions run high on the subject of what the Fed should do next. Some pundits argue that major actions to boost the economy are urgently needed. Others say that the current easy money policies are actually planting the seeds for bigger disasters later. But despite the haranguing for action from both sides, the Fed's ability to impact major issues such as unemployment may be far more limited than most assume. 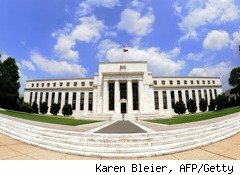 Some members of the Fed, meanwhile, are becoming increasingly open about the institution's limitations. There is no shortage of high-profile market commentators looking for the Fed to step in with measures to boost growth, of course. Goldman Sachs (GS) chief U.S. economist Jan Hatzius told Bloomberg News this week that he expects further easing of monetary policy, and says anything short of a $1 trillion is a waste of time when it comes to the Fed making additional securities purchases. A vocal minority, meanwhile, says that the Fed is making things much worse with its easy money policy, and is pushing for a sharp rise in interest rates. Raghuram Rajan, a former International Monetary Fund chief economist and now a professor at the University of Chicago, this week urged the Fed to hike interest rates by a massive 2% in order to stave off future asset bubbles. Raising interest rates while unemployment remains near 10% and inflation is tame flies in the face of conventional wisdom, but Rajan's track record suggests there are good reasons to hear him out. Back in 2005, he warned of growing risk to the banking system, though then-Fed Chairman Alan Greenspan was largely dismissive of his concerns. Still, deflating future bubbles hardly seems to be the most pressing concern when the economic doldrums are inflicting serous suffering here and now. But when it comes to easing that pain by fostering job creation, some at the Fed are openly wondering what more they can do. Minneapolis Fed president Narayana Kocherlakota, for example, recently chalked up a large portion of the high unemployment rate to a mismatch between skills and geography, rather than merely a lack of overall demand for workers. "Monetary stimulus has provided conditions so that manufacturing plants want to hire new workers," Kocherlakota said. "But the Fed does not have a means to transform construction workers into manufacturing workers." The magnitude of the unemployment created by those mismatches is enormous, according to Kocherlakota's calculations. Judging by job openings listed, he estimates that if the skills issue was eliminated, the unemployment rate would be closer to 6.5% than its current 9.5%. There are plenty of developments that would seen to corroborate Kocherlakota's calculations. Some employers are complaining that a shortage of skilled manufacturing workers is the biggest factor limiting their growth. Countries like Germany, with vast pools of skilled manufacturing labor in their workforces, meanwhile, are seeing their economies boom thanks to demand from fast-developing overseas markets in Asia and Latin America. Policymakers, then, may want to make a recalibration of the U.S. workforce a bigger priority, while toning down schemes to prop up demand at home. Worker retraining and measures to ease the pain of transition should be bigger priorities and absorb more resources than schemes to prop up asset prices. As the Fed prepares for its annual meeting in Jackson Hole, Wyo., pundits on both sides will no doubt be shouting for it to take quick action. But at least for now, the Fed board may simply have to do nothing, and try to find some new answers as it enjoys its yearly getaway.